Leading anti-abortion groups are working hard to cast certain birth control methods as a form of abortion, but they’re not necessarily being upfront about whether that signals a far-reaching shift in their agenda, according to a new policy analysis from the Guttmacher Institute. The medical definition of abortion is the disruption of a pregnancy, after a fertilized egg has been implanted in the uterine lining. All of the scientific evidence about conception contradicts the idea that birth control can do that. By definition, birth control operates by preventing fertilization or implantation. Nonetheless, we’ve recently seen the rise of the right-wing talking point that certain contraceptives — specifically, the morning after pill and the intrauterine device (IUD) — can induce an abortion. This line of argument was infamously advanced by the Hobby Lobby case that recently went before the Supreme Court. Guttmacher researchers reviewed the recent rhetoric from some the most influential right-wing groups in this issue space — including Susan B. Anthony List, Americans United for Life, the Heritage Foundation, the American Association of Pro-Life Obstetricians and Gynecologists, and the U.S. Conference of Catholic Bishops — and found multiple instances of these organizations asserting that those birth control methods can “kill embryos” and “cause early abortions.” They forcefully argued in favor of Hobby Lobby’s right to drop coverage for emergency contraception and IUDs. This new definition of “abortion-inducing drugs” has potentially radical implications. If abortion opponents really believe that these birth control methods operate in the same way as an abortion, that suggests they may push to include Plan B and IUDs in existing laws that heavily regulate women’s access to abortion services. For instance, will women need to undergo a 24-hour waiting period and mandatory counseling session before being allowed to take Plan B? Will IUDs need to be inserted only in clinics that meet the same standards as ambulatory surgical centers? “There are hundreds of policies in effect that regulate and restrict access to abortion care across the United States… Treating some contraceptives as abortifacients and applying the full range of existing abortion restrictions to them would have a dramatic impact. In many cases, the outcome would border on the ridiculous,” Joerg Dreweke, a senior policy communications associate at Guttmacher and the author of the new analysis, writes. So far, no one is advocating for that. 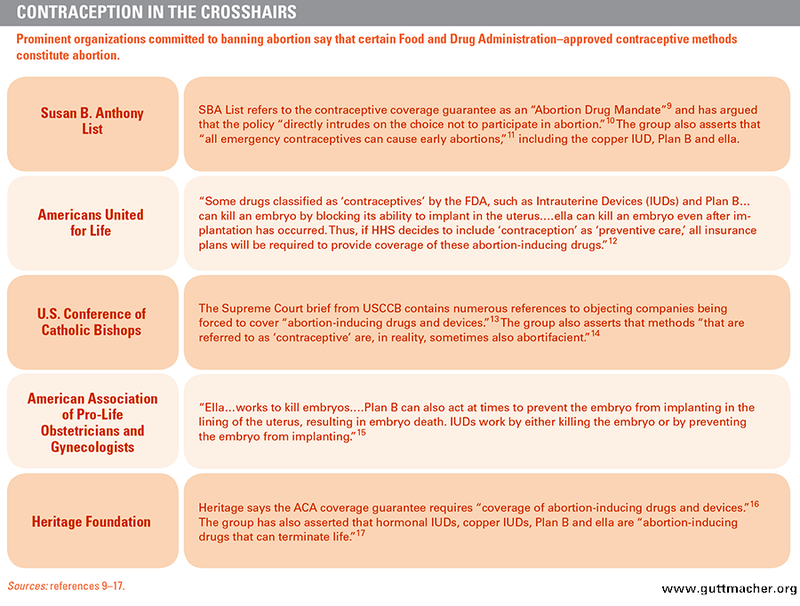 According to Guttmacher’s review, anti-choice activists are being very selective about the contexts in which they conflate birth control and abortion. They’re carefully avoiding the suggestion that Plan B and IUDs should fall under the current state-level restrictions they support. Reproductive rights advocates have long argued that abortion opponents are “coming for your birth control.” RH Reality Check, an outlet focused on sexual health and reproductive justice issues, has been tracking stories along these lines for the past several years. Mainstream members of the Republican Party, however, say their views are being misrepresented and maintain they don’t actually support restricting forms of birth control. But it’s clear that this conflation of contraception and abortion is starting to make its way into the political realm. This fall, for instance, Colorado gubernatorial candidate Bob Beauprez (R) sparked controversy when he said that IUDs cause abortions. In May, a county in Kansas rejected a grant for contraceptive services from the state health department after one commissioner compared IUDs to murder. Ironically, there’s a lot of evidence that expanding access to birth control methods like Plan B and IUDs can lead to fewer abortions. One five-year program in Colorado, for instance, found that giving affordable IUDs to adolescent girls helped lower the teen pregnancy rate by 40 percent. The abortion rate also fell by 35 percent over a three-year span in the counties that participated in that program. And according to a large study in St. Louis that essentially replicated Colorado’s effort with low-income women, the national abortion rate would plummet if more women across the country could start using IUDs.